1.No key, 5 password security firm, easy to replace the password. 2.Protecting your bicycle, ATV or other valuables against theft. cable for strong cut resistance. 1.Dial the combination wheels to 00000 and withdraw the cable. numbers are lined up with the pointer. position in a counterclockwise direction. new password to open lock. 6.Repeat the 1-5 steps above to reset the combination anytime you like. password, you can't open lock forever. it back so they cannot successfully set new password. The wire rope is made of high quality steel wire rope,flexible steel cables for strong cut resistance.PVC coating helps prevent scratching and keeping more durable. 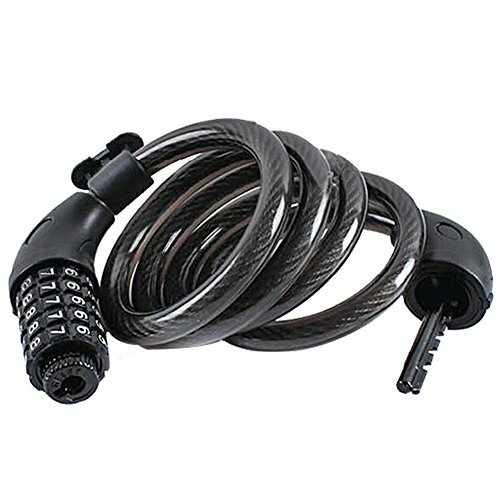 Smart 5-digit resettable combination chain lock,10,000 possible resettable word and letter combinations. Ideal for bicycles, skateboards, gates fences, grills lawnmowers, sports equipment, tool boxes ladders. No need for keys, more convenient to use with combination. Attach the lock on seat post or cross bar when not in use. Easy and convenient to carry.